Ok this is a weird one and maybe I just don't understand how mains work (though I feel I have a good enough knowledge to stay safe and do basic breaker work & wiring). After reading these values I figured I screwed up, so I removed the plug and put everything back to how I found it. However, there was another 240v plug in the shop that was already there so I decided to test it and it read the same values. 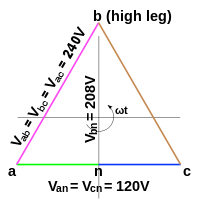 Violet and red make sense, but green seems impossible?? How is this possible? Is this normal? Was the previous tenant hooking up some non-standard machinery? EDIT: Continuity between the 3 sockets is infinity, there's no short, the plug seems good. The black wire was attached to the vertical slit (where violet and green meet). Black wire had a very low resistance to the conduit so I would say it's "safe" to assume that's the common rail and tied to ground as it should be. The coloring would also suggest this. Do these look like your numbers? That is wild-leg delta. A perfectly plausible thing to see in a commercial shop. 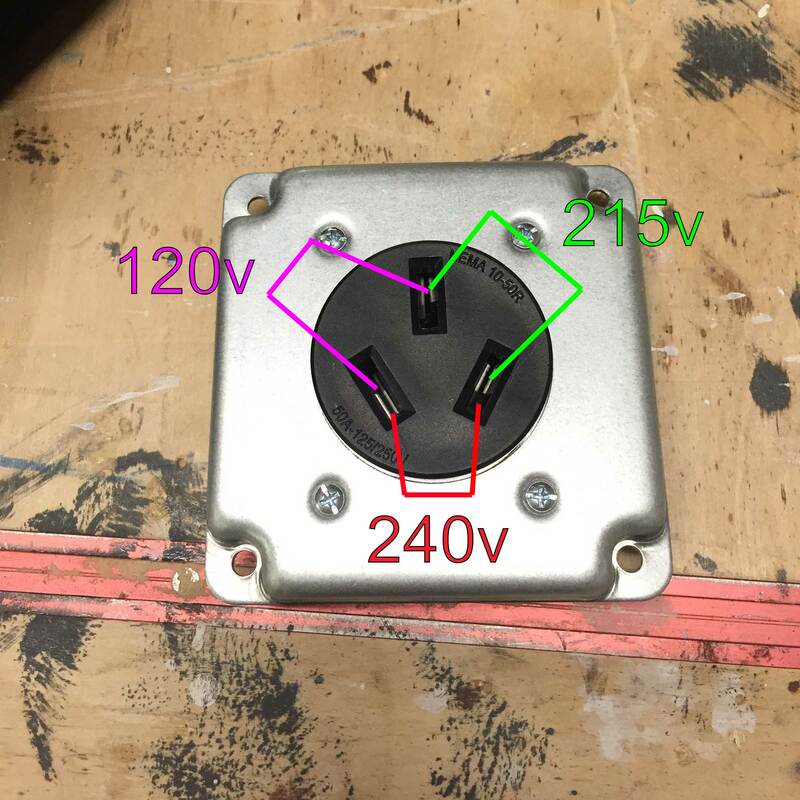 You can see where, by grabbing the correct 2-3 wires, it can supply a variety of voltages including 120/240 split-phase (a-n-c). By law, the wild leg (208 from neutral) must be colored or taped orange. NEMA 10 connectors are illegal** for new work and have been for some time, they are only legal and sold for replacing broken ones already installed. It has been fully replaced by NEMA 14, which is the same thing with a ground, or NEMA 6 if you don't need neutral. Any of them would grab phases A and C in this drawing. It looks to me like they grabbed the wild leg by mistake. This would happen if they have a 3-phase service panel and they put the 2-pole breaker in the wrong breaker position (because they don't know what they were doing). As you probably know, on most split-phase panels (120/240), every other breaker row on the panel is the opposite leg, A B A B A B A B A B. And so if you use a 1-space breaker, you get 1 pole, and if you use a 2-space breaker, you get 2 poles and thus 240V. It doesn't really matter which 2 spaces you use. A 3-phase panel works the same except it's A B C A B C A B C. With me so far? You can use 1-space, 2-space or 3-space breakers. (well, 1-space makes no sense on regular Delta.) Now if the 3-phase is wired Wye or regular Delta, power is symmetrical, so you can use any position without worrying about it. However, a wild-leg delta system, watch out! Every third row in the breaker panel is the "wild leg". If you want 120/240 split-phase, you must plug your 2-pole breaker into specific places that avoid the wild-leg row. The problem is, the last guy didn't. Mind you, the National Electrical Code specifies which particular phase must be wild-leg on the panel. If it's wrong, I'd fix it, but beware - there's a difference between swapping 2 phases and rotating all 3, and the difference is motors will run backwards. I for one would paint the high-leg rows orange on the panel cover, so it's obvious. We are code mavens here, and when you really embrace it, code is your friend. Code protects you from wrecking stuff and killing people. The Oakland warehouse fire should be top-of-mind when working in converted spaces, so very preventable - and thousands of creative types are being evicted from similar spaces, a tragic loss to arts and culture. You want the fire marshal coming through and seeing really competent electrical. Since you say you do have good grounds (presumably in the metal conduit), please eradicate those horrible NEMA 10 receptacles. Go NEMA 6 if you need 240V single phase (wild-leg is OK here). 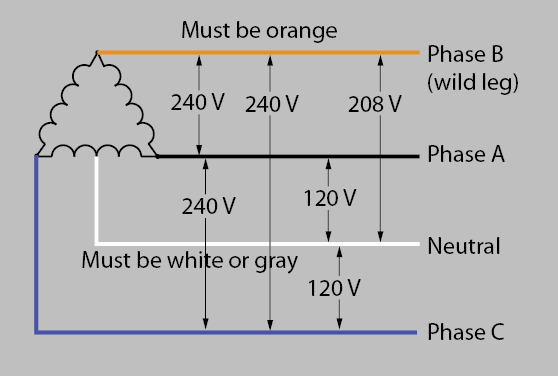 Or NEMA 14 if you need 120/240 split phase (cannot be wild-leg). Generally in this type of wiring, you don't just install random receptacles. You wait until you know exactly what machine will go there, and then provision the power it requires, using the receptacle that's correct for that. (e.g. NEMA 15 if he wants 240 3-phase). Here are the right colors when dealing with wild-leg. The lower phases can be any color except orange, white, gray, green or green/yellow. If you see any existing neutrals, grounds or high-leg that aren't the right colors, please use some tape of that color to tag them, for practical clarity. Mind you, for neutrals and grounds 6 AWG or smaller, Code requires you use wire of the correct color, so do that in any new work. ** By context, we are in the native habitat of the NEMA 10 receptacle, i.e. US, Canada and the rest of North America. [we also claim Colombia because Shakira.] Eradicating NEMA 10 is a best practice everywhere it exists. Don't confuse "poorly enforced" with "legal". Not the answer you're looking for? Browse other questions tagged wiring circuit-breaker 240v or ask your own question. How should I wire this ceiling light pendant? How do I wire my old 3/4hp 115-120v 50-60Hz HVAC motor to make an exhaust fan? Smoke and Sparks From Circuit Going to 6 Wire Outlet?